It’s raining outside, it’s raining inside (seriously!). The sky is blue, the sky is gray. We have no moon. From two-moon land 1Q84, to no-moon land. Shenzhen has gone crazy. It’s one thing to come home to a chilly apartment, but to come home and to see water literally pouring down your walls, and having to slip and slide through an inch of water just to get to your bedroom, well I don’t know what the heck’s going on. Humidity? Or just plain weird?! Now rain outside, well that’s OK. 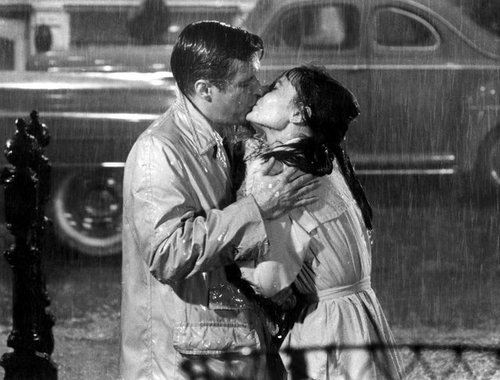 Especially if, like Holly Golightly it involves kissing a handsome gent, or dancing without an umbrella (not a common sight in China, they LOVE umbrellas here!). It’s cleansing. And it produces rainbows. Cool! But raining indoors wasn’t the only strange part of today. I actually saw an old Granny steal a kids bike. As she rode away, the child screaming behind her, she cackled into the wind and sped off. I sincerely hope she was just joking around. Poor kid! Just another surreal day in the big city.